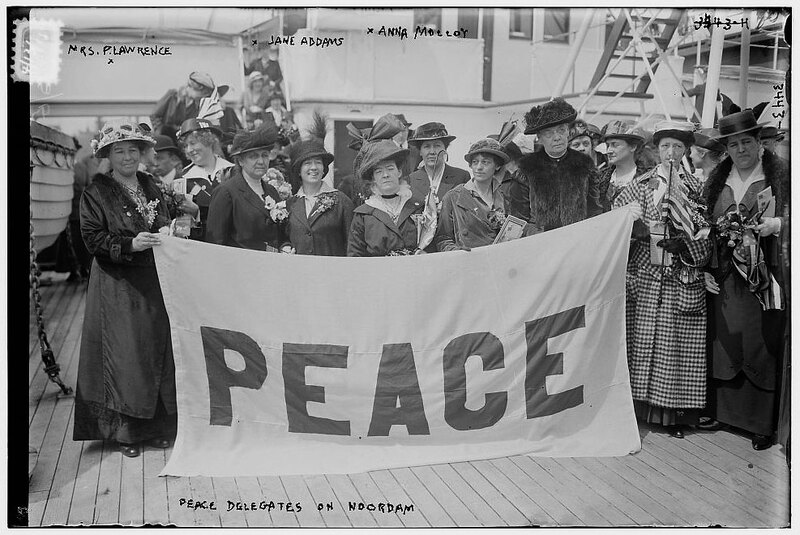 Female Delegates to the 1915 Women’s Peace Conference in The Hague, aboard the MS Noordam, c. April 1915. Library of Congress. LC‑B2‑3443‑11. 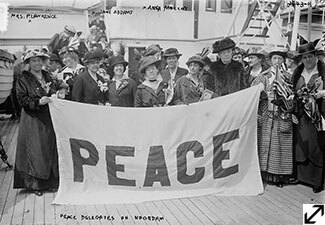 The Woman’s Peace Party was an American organization composed primarily of social reformers who urged the United States not to fight. Select members attended this international meeting in 1915. The War divided families as well as countries. Born in Russia, Anna Strunsky immigrated with her parents first to New York and then to San Francisco, where she studied at Stanford and joined the Socialist Labor Party. She was part of a radical circle called "The Crowd" that included the writer Jack London. In 1906, while covering the aftermath of the Russian Revolution of 1905 as a journalist, she met and married the American Socialist William English Walling. Around 1915 the Wallings moved from Long Island to Greenwich. Anna Walling continued to give speeches at feminist and anti-war rallies and to go on lecture tours. She joined the Woman's Peace Party soon after its founding and served as honorary vice-chair of the New York chapter. She was a friend and supporter of Emma Goldman, the political activist who was jailed for two years during the War for opposing the draft. Unfortunately, difficulties in the Wallings' marriage were exacerbated by their opposing political views on the Great War. English Walling, as he was known, assumed an extremely pro-war stance and advocated early on for America's entry even as his wife was lecturing at pacifist meetings. They never fully reconciled and were divorced in 1932.